Situated at the heart of the Portomaso Waterfront in the fashionable St. Julian's district, the Hilton Malta hotel occupies an enviable position overlooking the Yacht Marina, and offers a distinctive golden-ochre contrast to the Mediterranean's azure waters. Discover one of Malta's top 5 star hotels located in the heart of downtown St Julian's and right at the water's edge. 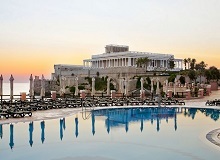 Winner of the Top 10 Luxury hotels in Malta in the Tripadvisor 2013 Travellers' Choice and the Mediterranean's Leading Resort in the World Travel Awards 2013 , the Westin Dragonara Resort ensures your idea holiday accommodation. Situated in the grounds of a 19th century Maltese Villa on the seafront of the picturesque Balluta Bay, one finds the 5-star hotel, Le Méridien St Julians - an illusive combination of innovative and contemporary design. 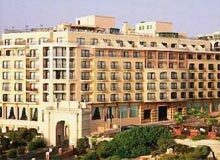 The Golden Tulip Vivaldi is a 4-star luxury hotel in Malta situated in the heart of Saint Julian's, within walking distance of a splendid beach and local attractions. This modern property on South west coast of Gozo boasts spectacular accommodation and one of the most impressive views of Xlendi Bay in the area. The resort is close to St. George's Basilica, Ta' Cenc and other attractions.